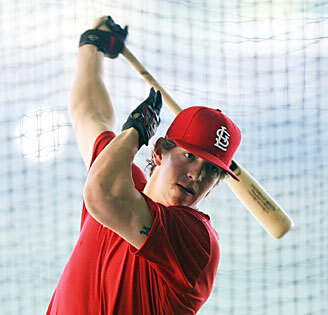 It would seem that Colby Rasmus’ days as a St. Louis Cardinal are number. Apparently, Raz asked to be traded last year and renewed that desire this year. Instead of granting his request, the Cards traded fan favorite Ryan Ludwick. Anyone else scratching their heads? There is no doubt that Colby could be a major asset to this team in the future but if he has no desire or drive to play for this team, it’s best for everyone if he moves on. Let’s take my favorite punching bag into consideration: Milton Bradley. Bradley was a cancer for the Chicago Cubs last year. He hated being there and was just as hated by the fans. He brought that team down with his attitude. Do we want that to repeat in St. Louis? Maybe it already has. We don’t know what happens in the clubhouse and the players are too suave to let on to problems. I think, in light of this recent news, that we can pinpoint one of the problems this team has had. It may have bee infectious enough for the boys to not want to take the field with a disgruntled player. Baseball is supposed to be fun. When it isn’t, it shows. This year, it certainly shows that this team hasn’t been having fun. How can you leave out the main reason why he wants traded? TONY LA RUSSA. Their relationship has been poor because Tony gives no respect to Colby and doesn't support him going to his dad for advice or any other crap that Tony would hold a grudge against someone for, like eating a steak every night. Lose Tony, keep Colby. We know who will have a more profound influence on this team winning for the next decade. This won't be the first fan favorite Tony has chased out of town. Let's just hope that if he does go, he doesn't end up beating us like Scott Rolen.